On the afternoon of September 13th, Mr. Võ Thành Thống – Chairman of Cần Thơ city People’s Committee received Mr. Vũ Đức Đam – Deputy Prime Minister coming to attend the 10th Conference on Cooperation between Vietnamese – French Localities. Reception for Deputy Prime Minister Vũ Đức Đam (center) at Cần Thơ airport. Also in the afternoon on September 13th, Vice Chairwoman of Cần Thơ city People’s Committee Võ Thị Hồng Ánh received Secretary of State in charge of trade, handicraft and consumption of the Republic of France Martine Pinville and her entourages at Cần Thơ airport. 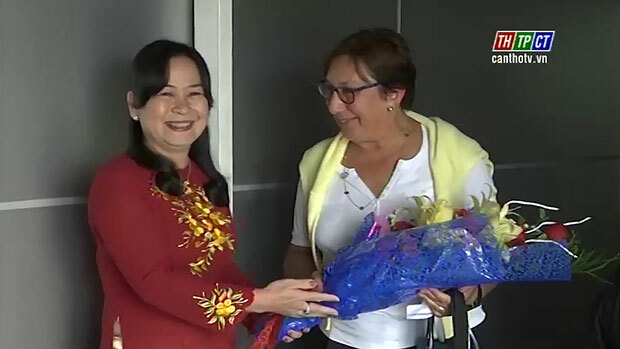 Ms. Võ Thị Hồng Ánh (left) received Ms. Martine Pinville (right) at Cần Thơ airport. As reported, there are 45 Vietnamese provinces and cities taking part in the Conference. Also, there are 14 French regions with 231 delegates coming to the Conference, aiming to further tighten the friendship, cooperation between the 2 nations, to continue opening up opportunities for Vietnam and France to exchange, seek for cooperation in various fields in coming time. The vice chairwoman highly valued France’s supports for Vietnam in general and Cần Thơ city in particular in the past time in many fields like medicine, education, economy, environment…./.